In my opinion, this venue and event is not for beginners. In the Dallas area, it is pretty much the only lake where you get conditions that will help prepare you for open water. It is Doug's preferred venue for training for the Worlds. It is at this event that I first met Doug. He sat down next to me at lunch, was introduced to me, shook my hand, said hello, asked me how it was going, didn't wait for a reply and has completely forgotten meeting me there. In his defense, his house had flooded that day and he had only just arrived and had other things on his mind. I was miserable at that regatta. First time sailing a Sunfish there, no idea how to de-power the boat, so far behind the fleet that I was the last person off the course for lunch and there was no one at the ramp to help me and when I got to the club for lunch, most people were done. It went downhill from there. One year, I quit early on the first day, sat up on the hill watching and listening to the race committee on the radio. Several Lasers were tipping so much that they were tying up the rescue boats and becoming a hazard and the RC was discussing forcing them to go in after x number of tips because they had no business being out there in those conditions. Lots of boats from all fleets left the course voluntarily that day. Another year, I was quickly blown off the course and had strained and fatigued every muscle I had. 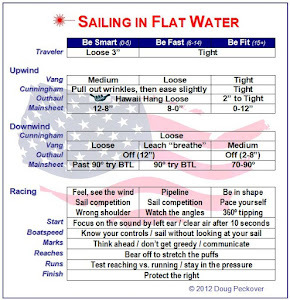 I jumped on a Sunfish with Doug insisting that I didn't have the strength to pull or hold the mainsheet. The picture of us at the upper right corner of this blog was from that day. The picture represents bad memories but lots of gratitude for Doug. Once again, this year I arrived half full of dread and really not wanting to sail. It was blowing, of course, and the waves were more than I'd ever seen. The Lasers have stopped showing up for this event so Doug and I were both sailing Sunfish. I considered quitting several times on the race course, I considered quitting after we came in for lunch and I was shivering from being so wet, and I considered quitting the regatta and not going back the second day. Nevertheless, I sailed all 6 races and it was definitely no walk in the park. Of the 16 boats registered in our fleet, 10 opted out of one or more races. Of the 43 boats registered for the regatta, 21 opted out of one or more races. One boat, an 18 foot Aussie skiff was the entertainment of the weekend as we all took bets on whether they'd make it down the launch ramp, out of the harbor or to the start line. 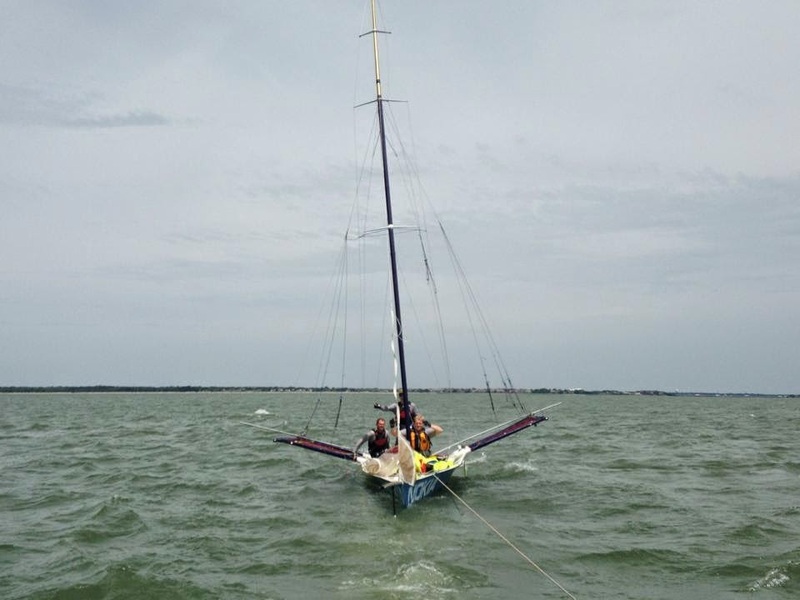 Two attempts, a rig change and a shredded sail and the winner was 'they made it down the ramp, out of the harbor but never made it to the start line'. Note: it wasn't being sailed by Aussies but kudos to them for trying and having such a great attitude about it at the prize giving, promising to start a race next time. Meanwhile, I had managed a 3rd in one race with Doug so far back I couldn't see him. In another race I crossed a boat, looked back and it was Doug with the most surprised and perplexed look on his face. At the next crossing, he was starboard and even though I usually call out "wife" which trumps all when crossing Doug, he wasn't giving way and I had to duck him. When I tacked back to starboard, a gust hit that just about took me over. Doug hiked, flattened the boat and left me behind. I finished the regatta in 6th place and Doug finished in 2nd. Did I mention that of the 17 boat fleet, 10 opted out of one or more races and one of those still finished above me ... so beat 1 boat. Two of the better sailors didn't sail all the races or Doug would have finished 3rd or 4th. 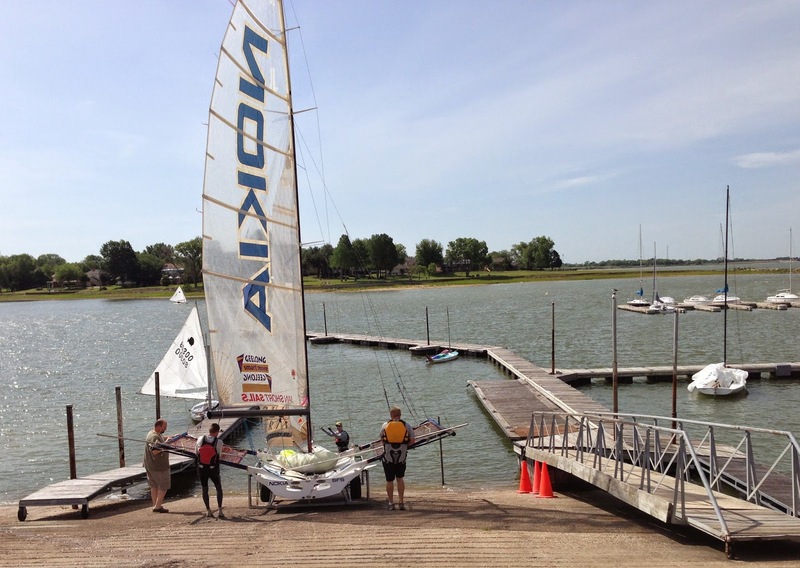 Let it be known, this was the weekend that Doug decided to train for the Laser Worlds by sailing a Sunfish. Many years ago Doug was out in his Laser training for the Laser Worlds and Paul Foerster (Olympic gold and multiple silver medalist and, oh yeah, multiple class, multiple World Champion) was training in his Sunfish for the Worlds or Pan Am games and he started going upwind with Doug. Doug was thinking he's in shape and geared up for the Worlds and he's going to smoke poor Paul in his little, tourist, rinky dink, beach boat. 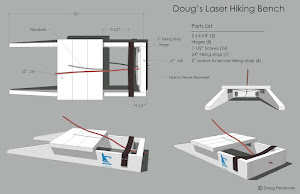 And Doug learned that day that a well sailed Sunfish can hold a Laser in a breeze. Doug couldn't shake him no matter what he did and when they went downwind, Paul passed him. Doug has been fretting about not having a decent sailing partner to train with for the upcoming Worlds so as he was sailing against Greg Gust and Paul Foerster this weekend, having really inconsistent races but once actually being in front of both of them for a couple of legs and mixing it up for a little bit, the light went on ... even though I'd been suggesting it for years … the sailing talent is certainly in the area, they just aren't sailing a Laser ... the downwind techniques the Sunfish uses are essentially the same for a Laser … and a Sunfish sailor is born. I've been trying my hand with a Sunfish and really like it. But Doug and David left us in the dust at Conroe a few weeks ago. But you are right about downwind. I could make ground on them on the sleigh ride. Much more forgiving boat down wind than the Laser. Sleigh ride is right. 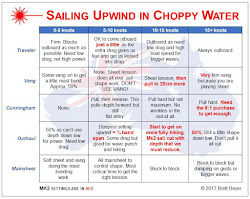 As I described on another blog, with the waves and gusts downwind, I was cleating the main and two-handing the tiller in a cross between steering a gondola and riding a broom about to take flight. Lots of fun ... and a little scary. No way I could have handled in in a Laser. Doug loves his Laser but I catch him smiling quite a bit when sailing a Sunfish. LOL. It's a tough life for these guys going to the Masters Worlds, trying to find suitable training partners. I think Doug is doing better so far than a friend of mine, a multiple and current Laser Masters World Champion. You would think what with all the Laser sailing talent around Newport he would find it easy to find worthy training partners. But no. He kicked off his training for the 2014 Master Worlds yesterday evening, tuning up with……. yes, Tillerman of the Proper Course blog! Good training for me. Not so much for him, I suspect. I spent most of the session watching his transom disappear in the distance. But I did manage to pull a couple of moves which gave him some learning experiences. Too bad you aren't going to the Worlds since you'll be all tuned up and ready.